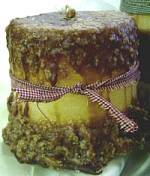 If you like grubby rustic looking candles Starla and Lisa’s candle making website offers step by step instructions. A classic primitive country style type of candle is usually made with darker colors on the outside and is achieved by “caking” the candle with whipped wax. To make the whipped wax, you literally whip it with your electric mixer. You can then dip, drizzle and apply some with a paint brush for your own unique masterpiece. A pretty country ribbon to finish it off is a nice touch. I like the checkered patterns but use any you like.